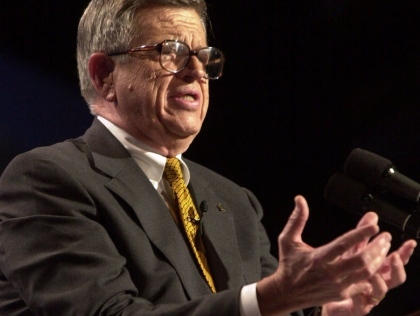 I never had a short conversation with Charles Colson. We talked only twice and I came away convinced he had too many thoughts and too many tasks to squander on small talk. Colson died on Saturday at the age 80. The obituaries have noted his life and career: Nixon White House operative (famous for saying he’d be willing to run over his grandmother for the president and other tidbits). Watergate figure who did prison time for obstruction of justice. A “born-again Christian” who started what became the largest prison ministry in the world. A public thinker, author and frequent gadfly who, to his credit, aimed to appeal to the brains of skeptics and believers–and not just their hearts–in his articles, books and the Wilberforce Forum. But as several commentators have said since he died, Colson’s most memorable legacy may be his life, a picture of redemption. The first time we met was in July 1990, when he was a keynote speaker at a church convention in Kansas City. At the time I was editing a small Christian magazine called The Lookout and arranged an interview. Actually, I thought I would just be part of a press conference, but only I and an editor for a small Filipino Christian magazine showed up–and after a few questions, the Filipino editor left. It was Chuck Colson and me, one on one for 45 minutes. He seemed a little annoyed, maybe because no Kansas City media showed up, but he patiently answered my questions and in the process gave me a lesson in interviewing. I had my agenda, but it didn’t take long for the old lawyer and politico to skillfully and subtly take charge. I didn’t even notice until I looked at my notes later. I don’t remember much about the interview or the resulting article itself. What I remember most clearly is his energy, his Yankee-lawyer drive (not to mention his clipped cadence), his finely sharpened mind, and, when he talked about his standing before God, his humility. He didn’t laugh often during our conversation, but he exuded what they would call in the 19th century “good cheer.” Here was a joyful man. 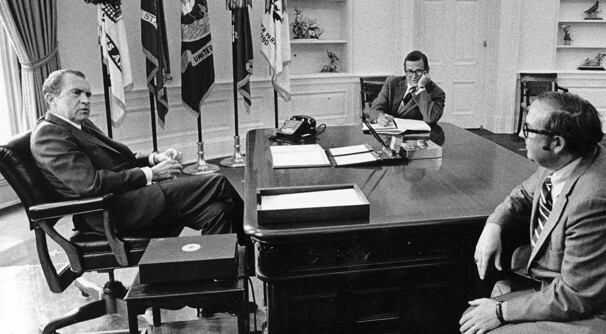 Colson during his White House days, with President Nixon (left) and aide Ken Clawson (right) in May 1972. I spoke with him again at length almost nine years later. Another interview, but this time it was for a job. We spoke by phone since I was holed up at the suburban Washington offices of Prison Fellowship and Colson’s think tank, the Wilberforce Forum, and he was in Florida. I had arrived just ahead of a February ice storm, the same one that prevented him from traveling to D.C. Colson was my last interview of the day. I sat in an office alone with a phone, and we talked for about a half hour. He asked a few questions about my family and my background, and I think we spent about 10 minutes or so actually talking about the job–but then he took off for intellectual highlands and brought me along. The interview changed altitude quickly, almost naturally: From the job to the goals of the Wilberforce Forum and his writing, to the shifts he saw in Western culture and in the church. He’d talk a few minutes and then punctuate his remarks with a question: What did I think of this author or that trend? What did I make of this historical connection he had made? He was testing me, of course, but at some point the mode shifted from interview to conversation. Through the phone lines, I could feel that familiar passion and good cheer. I can’t claim Chuck Colson as a friend or colleague. (It didn’t work out for me to go to Prison Fellowship, probably the best result for all concerned.) The time I spent with him was a blip in the course of his 80 remarkable, turbulent, redemptive years. But I’m grateful that we met and that I got to join those heady, challenging conversations with him. And like so many others, I’m simply thankful for Chuck Colson. He realized, maybe as few people do, that he was a rescued, reconciled man, and he spent his days aiming to pass on that gift. I am so glad I got a chance to meet Chuck Colson. Like so many others, I’d gobbled up Born Again and followed his ministry for years before I started submitting articles to Breakpoint in 2000. When I was invited to the Centurions Conference in 2005, I was gratified to have the opportunity. He wasn’t in yet during my morning general address but he came in during my afternoon workshop on how to read a film—no pressure. Later I got my pic taken with him and he sent me a truly wonderful note about enjoying my film lecture. The next year I was listening to a speaker discuss something I’ve now forgotten, but during Q&A I asked the speaker for clarification about one of his points but his answer really didn’t help. Then I felt a hand on my shoulder and Chuck was there and asked the speaker to clarify since he could tell the speaker had missed my point. Little things like that that spoke to his graciousness.